CANMORE, AB – Grizzly Paw Brewing has announced details of two new releases that are now available. 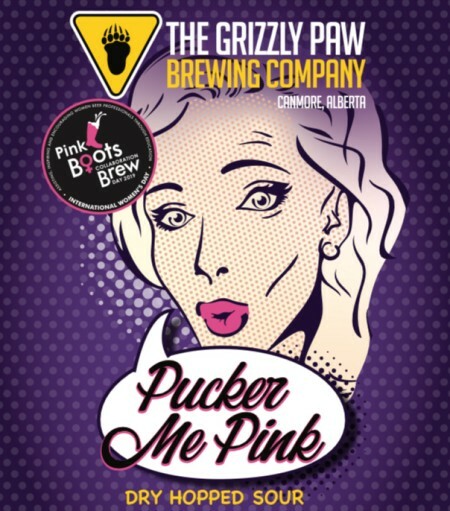 Pucker Me Pink is the brewery’s 3rd annual benefit beer for the Pink Boots Society, with drinkers being warned to “prepare your taste buds to take a tart and juicy journey.” Launching today (April 12th) at 5:00 PM at the original Grizzly Paw brewpub, it will be available on tap and in bomber bottles, with partial proceeds from both to go to the Society. Mountain Mixer is a new 12-pack that features three 355 ml cans each of four Grizzly Paw beers, including Grumpy Bear Honey Wheat, Beavertail Raspberry Ale, Running Elk Red, and the new Three Sisters Pale Ale. It will be available at liquor retailers throughout Alberta starting next week.